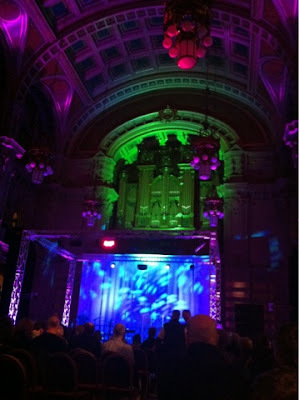 Review - Cowboy Junkies, Kelvingrove Art Gallery, Celtic Connections, Glasgow January 23rd 2013. I bought a very random selection of tickets this year for Celtic Connections, which has a great knack of turning up surprisingly random gigs. However, when I saw that Cowboy Junkies were playing I was genuinely and nostalgically excited. It is 25 years now since they brought out Trinity Session, their second album. It is often cited as the forerunner of all the alt.country stuff, with its lo-fi sound and Margo Timmins's languid singing. When I was in the mood for it I'd have many a night of playing that album over and over, maybe alternating with kd lang's "Absolute Torch and Twang" and 10,000 Maniacs, "Hope Chest". Their "Sweet Jane" was the one that I knew, long before I heard of The Velvet Underground. 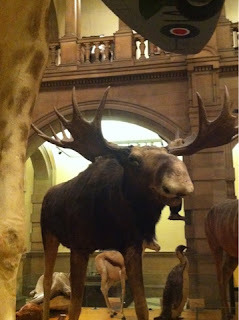 The venue for this gig was intriguing, the main hall at Kelvingrove Art Gallery. I've heard baroque music here, choral music and the big organ of a Sunday. The echoey acoustics work brilliantly for those things. I was less sure if this would be the case for amplified electric guitars. First up was John Murry. He looked like a man who'd be happier playing in a darkened bar than the rather to the stilted, seated, middle-aged Celtic Connections audience. My fears about the acoustics were shown to be justified as soon as he started talking. His opening gambit of stating "I am not intoxicated!" was almost unintelligible and once he started playing the muddied acoustics did his confessional tunes no favours at all. About the only thing I understood after that was when he asked the audience "Why is there a Spitfire chasing an elephant?" which to be fair was a valid point. The atmosphere was pretty flat during his set, but he finally relaxed into by his last song and was chatty and relaxed at the merchandise stall. I'll buy his cd "Graceless Age" and try it again back home. I was hoping that this had just been the traditional "don't give the support act much time for a sound check" thing and I had high hopes that Cowboy Junkies would temper their sound to the venue, after all the Trinity Session album had been recorded in a Toronto church. Although their more contemplative tempo worked better, they still struggled with the acoustics except when the bass player and drummer stood down and they did a few more acoustic numbers, such as Remnin Park. A lot of the set was made up from material from their "Nomad Series", 4 albums recorded over the past 2 years with common themes running through them. Late Night Radio and Damaged From The Start were stand out songs, whilst 3rd Crusade seemed to borrow and stretch a riff from "Play That Funky Music White Boy". They finished off with some of their earlier stuff including "Sweet Jane" and an excellent rendition of their "Blue Moon Revisited" and an encore of "Misguided Angel" confirming that Trinity Session stuff was what most of us had turned up to hear, and they ended with a Neil Young cover.